I shouldn’t have to be writing this, But as some people will know, I’m utterly sick of repeat questions. This is a FAQ on the WordPress FileSystem abstraction which i wrote as part of the Summer of Code project to implement a Plugin Upgrader for WordPress (note: the actual upgrader in core is different from what i originally wrote, however ideas and code were lifted and put in their place by a much better coder than I), The content of this post is based on the situation as of today, 20/Feb/09, I fully expect these answers will not remain current in the years to come, But hope they provide some background information on them. What methods/transports does WordPress support for accessing the filesystem? SSH – This method uses the PHP SSH2 extension to connect to the server and manipulate the files there. What requirements must be met for a transport to be used? In the case of the Sockets or Fsockopen case, The 3rd party FTP Class “PemFTP” is used. I should also mention, That this supports Secure FTP as well. It requires the PHP SSH2 Extension to be available, This generally requires compiling from source unless you’re lucky enough for it to be available in Pecl for your distribution. Unless you’re running a Dedicated or VPS server, This is not usually available to you due to the above. Why does my WordPress Install require my FTP Credentials? My other blog doesn’t!! As above, The Direct Method(Which requires no credentials) only works in a very certain setup, Generally, This is only servers running with suPHP or suExec with PHP as a CGI – Servers running this exist, however, Due to hardware constraints (running these uses extra resources) most hosts which oversell do not use this method. Move to a different Hoster, Or if thats not an option, Simply entering your FTP details. You can see a item later in this FAQ for how to hard-code these settings if you want. No, Seriously, Why cant i use the Direct method? I think i should be able to!! Because your server configuration is not supported. The problem with this, Is its insecure, WordPress shouldn’t be encouraging non-secure installation methods, Yes, I realise you need to chmod your uploads directory in a few cases, And thats OK, Its a convenience, Its annoying to have to enter credentials every time you want to upload a file..
Thats all nice and well, And that means that PHP can write to your WordPress folder, However, Its got one big gotcha, Whilst it can write to the directory, Theres an issue: The files PHP create will be owned by the webservers username, And the group will be set to that group, the files will NOT be owned by your username. You will encounter errors upon attempting to delete the files via FTP, Simply due to the fact you do not own the files. Ok, This isnt too common, But sometimes PHP’ will have dodgy extensions, or configurations, infact, Its VERY common for a hoster to have a crap install of PHP, the FTP extension and CURL are common culprits for being badly configured, Unfortunately, Theres not much you can do to fix stupid hosts, other than complain. I run FTP/SSH on a non-default port!, How can i use this with WordPress? WordPress complains that it cant find my WordPress installation! Whilst this should be highly uncommon (I Hope! ), It can happen sometimes, So read on to the next item for a solution. By default (And you cant change this without a plugin) WordPress saves all your entered details in the database (except password, It only stores the server address, port number, and username), If you do this once, WordPress will remember them, You may then define your password in your wp-config.php file if you so wish. But be warned, In the case where your server is compromised, OR if other users on the system can read your files (As some badly setup shared hosts are), then you may be leaving yourself wide open to an attack if anyone ever feels like it. Why doesnt WordPress support Method XYZ for acess? Because no-one has contributed a patch to add support for it. In WordPress 2.5, SSH was not supported, this was only added in a later version (2.7) due to someone doing enough work on it for it to be included. Why do you see yourself as the end-all for this? Some people might be surprised to hear(And others will not be surprised) that i get this a lot, But i do. In short, I dont, Please, Go ahead and implement your ideas, I mearly voice my opinion, My opinion does not prevent something from being included, But due to my involvement, A yes from me, Might give a bit more weight to getting something in, The same goes for all the core developers, And all those of us (me included) who regularly contribute patches to WordPress. WordPress is a comunity effort, Due to the size of the community though, There will always be some who are more well known than others, and thats unfortunate, But its impossible for core developers to keep track of everyone. Some people have said in the past that WordPress was being developed by a core few people who did what they wanted, and didnt take others thoughts into consideration. In some ways this is true, Matt for example, Has in the past said he didnt want something to happen, Due to the respect and the weight he carries, his voice might be the deciding vote, But plenty of times will there be things commited which Matt does not agree with. Many of the core developers develop code and features which users request, even if they have no need for it themselves, I would not be surprised if the top 20% of developers of WordPress only used 10% of its features. I personally for example, Have made very little use of the Plugin upgrader and installers. So to wrap this item up, No. Just no. I will voice my opinion, However, Take it with a grain of salt, Just like everyone elses, If you want to rip every single contribution i’ve made to WordPress out, and replace it with something you see as better, DO IT, if its better, then great, WordPress will be better off. I will do the same thing, If i see someone submit a patch which i feel could be done in a better way, Then i’ll submit a alternate patch, Quite often it’ll be a “wow, i didnt realise it could be so simple” or a “that looks much cleaner!”, or even “Isnt that what my patch does??? ?” Deal with it, And move on. You forgot to answer something! You know, I probably did, So if its before the end of March 09, Add a comment, and i’ll add it to the list. Why March? Quite simple really, After a month, i’m unlikely to care enough to update it. I might write an updated post in the future which corrects things here, or updates it for whatever is in wordpress at that point in time. I hope this has been of some use to someone out there. If it has been, Then its served its purpose. Fabulous info. As always you are the best! I have set up an ubuntu-based dedicated server and I was wondering why I can’t install/upgrade my plugins within WordPress. I come back to inquire ! I have disabled the PHP apache module. 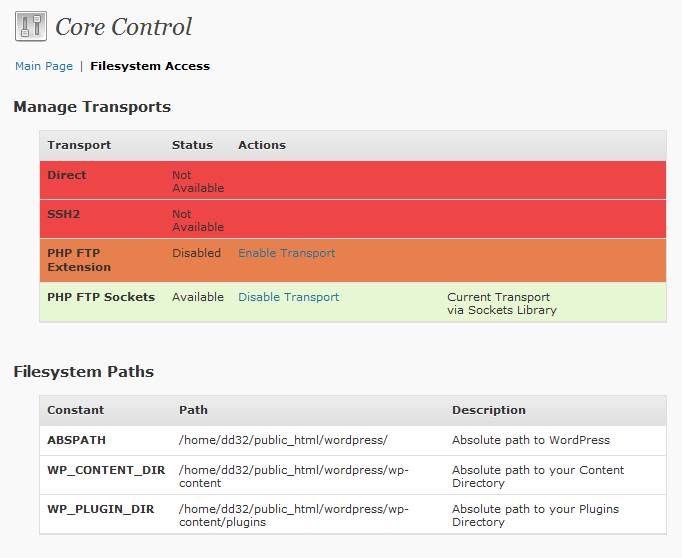 WordPress is up & running but I still can’t have direct transport mode . You’ll need to check your file permissions maybe. IMO, suPHP is NOT worth it, its too much of a pain..
To enable to direct transport on my server I chown all riles recursively to the user that php runs at. Then once the update is complete I chown it back to the ftp user. Nice and secure. Pingback: I’ve had enough with free host. | .::kazumastratos.net::. I’ve posted a question over in the WP forums about using this functionality in a plugin. If I override the auto detection done in get_filesystem_method() by setting define(‘FS_METHOD’, ‘direct’); before initializing WP_Filesystem() everything works perfectly. If I don’t force the abstraction class to the direct IO driver it chooses FTP and fails. Would you mind checking out the forum post and providing some expert advice? Hi – thanks for this great write up! I hope you can help me, I’ve been trying to get wordpress to work with FTP but don’t know what’s wrong. When I enter the FTP credentials, or even the wrong FTP password or server, I get nothing but a white page. > My FTP Doesnt work! > Unfortunately, Theres not much you can do to fix stupid hosts, other than complain. Being that I am the host myself, what can I look for? There are no error messages that I can find, is there some way to debug what’s going wrong with FTP? OK never mind – I recompiled PHP with “–enable-ftp” and all now works like a charm, thank you again for a great article that told me where to look! As I replied by email, In cases like this, you should always recheck your FTP details from the web host. In this case, the proper hostname to use would be ‘ftp.mgnfcnt.com’, or in rare cases, ‘ftp.mgnfcnt.com:21’ might be needed. I will hop in and try it. Thank you.